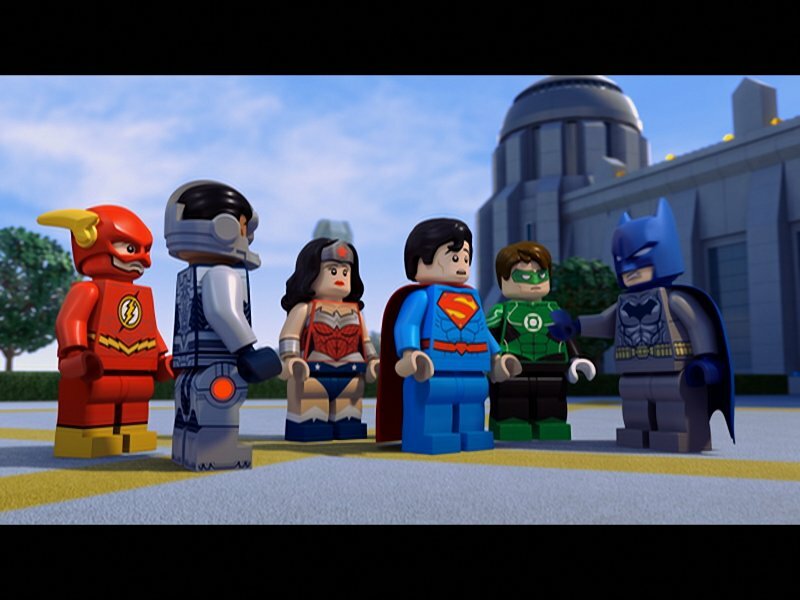 The latest installment in the LEGO DC franchise – LEGO DC JUSTICE LEAGUE: COSMIC CLASH is available on Blu-ray™ and DVD from 21st March 2016.…..but we were lucky enough to preview it early. Until now the Justice League has triumphed over every foe who has challenged them, but all of those enemies had one thing in common, they were alive! With the fate of the Earth and the Justice League at stake, can the World’s Greatest Detective outsmart the most evil supercomputer in the Galaxy? See the team unite once more and form a ‘firewall’ to save Earth from the super-computer villain, Brainiac. 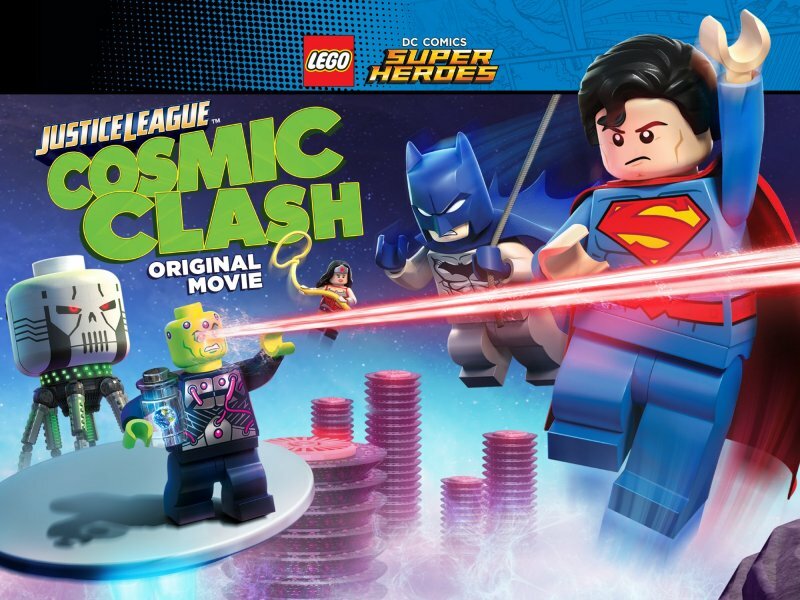 LEGO DC JUSTICE LEAGUE: COSMIC CLASH begins by seeing a planet being invaded, its contents being sucked up and then it is shrunk and brought up to Brainiac – who has scanned and compressed that planet into a file. He then puts the minute planet into a bottle ready to file alphabetically – but the bottle is dropped and the planet is no good. 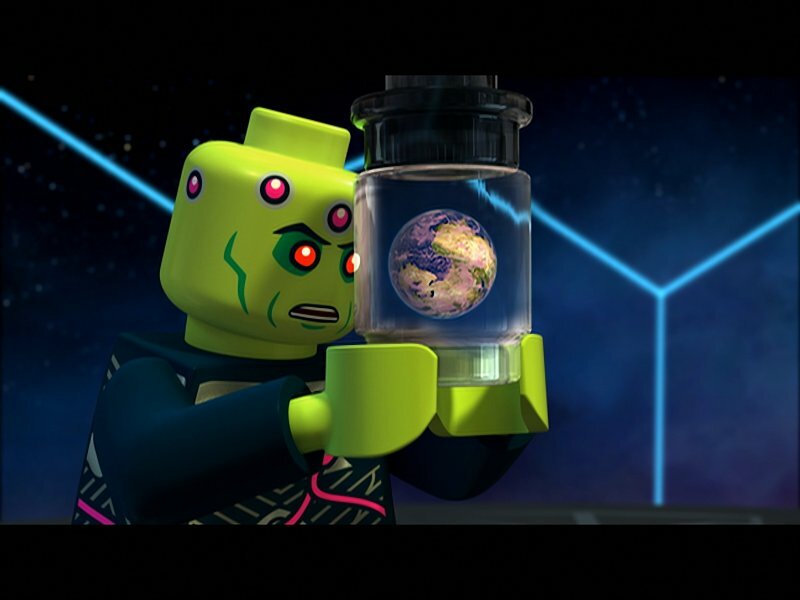 Now Brainiac needs to find another planet that begins with the letters Ea – which of course is Earth. The Justice League is introduced to the audience by switching over to Batman; he says that he can’t believe he has been working with the Justice League for a year. Then it switches to the rest of them – Wonder Woman, Cyborg, Green Lantern, Flash and Superman who are playing hide and go seek. Superman is the seeker and is so good at it – he knows that Green Lantern is hiding behind the only green furniture and Cyborg is in Wonder Woman’s invisible jet (because he forgets that the person inside it isn’t invisible). The Super League talk about how Batman is the World’s super detective and how he is their friend. That he is just a bit different in the way he does things. But then Cyborg is alerted to Brainiac’s plan and Superman explains that it is because he is collecting planets using a shrink ray. Brainiac discovers that Earth has a firewall (The Justice League) and send malware to Earth. There are missiles that fire laser beams and each of the Super League attack them in different ways (reflecting on their different personalities and strengths – such as Wonder Woman wanting to solve things peacefully). Brainiac activates the shrink ray but Superman breaks it. Brainiac looks up the members of the Super League and sees that they all have different powers, but dismisses Batman as he does not have any. Superman grabs a leg from Brainiac’s craft and spins it far away with the power he absorbed from the sun. Brainiac returns home and we see that there are lots more models of him, but they are not equals. They laugh that Brainiac’s spaceship has been upgraded with a moustache and down-graded with a black eye. They also call him a jerk! But Brainiac is a super-intelligent, hyper-obsessive-compulsive, super-computer and cleverly displaces Wonder Woman, Green Lantern and Superman to other time periods in Earth’s history – because he believes that they are the ones needed to be taken down. Then Batman, Flash and Cyborg must build and use the Cosmic Treadmill to race across time to retrieve their comrades – while members of the Legion of Super Heroes attempt to hold off Brainiac’s assault. Only time will tell in this battle for the fate of the Earth and the Justice League! My boys instantly loved this film – which features their already favourite characters. In fact I would go as far as to tell you that my house has LOTS of films, games and toys and they have far too much to entertain them – so you will know this was a hit when they watched it three times in a row (in fact as soon as it ended they wanted to watch it again! 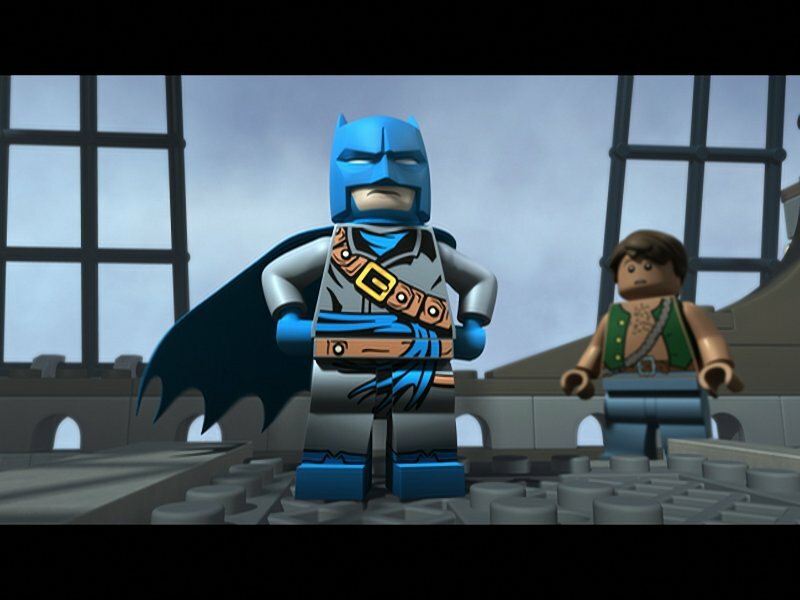 They liked the fact that it followed on from the last film with Batman joining the league. As a mother I liked the morals within the story – about friendship & acceptance – but also small stuff like the importance of wearing a seatbelt! Plus how encouraging Batman is, to give his friends the strength to overcome things for themselves. I liked the strong message that actually it is not okay to hurt not only women, but anyone. And the advice Wonder Woman gives to the women about being more powerful together than alone. There is plenty of humour, some of it subtle; including the additional feature of Caught on Camera – the filming, editing and directing of the film by the cast themselves. My 8 year old’s favourite part was when they were all small but could still defeat Brainiac normal sized. He did not like the beginning because he thought that the aliens were pathetic and should have tried to save their planet, or at least ran and hid in a cave when they were being scanned! He feels that the film could have further been enhanced with a feature from Bravio – because of his links to Superman and his planet being like a square version of Earth. 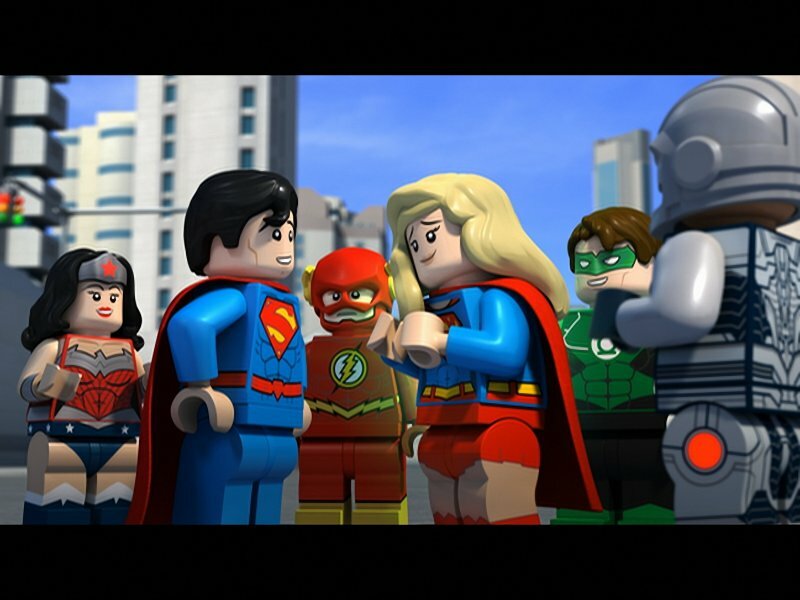 We received a free preview disk of LEGO DC’s JUSTICE LEAGUE: COSMIC CLASH – no other financial compensation has been given. See, Wonder Woman! She knows where it’s at! Us girls need to spend more time building each other up and forget about trying to compete with each other. There’s room for us all at the top. This sounds like a great film, I love that there are little morals in it as well as the ongoing storyline, definitely one to look out for.